Phuket Island itself has beautiful beaches and a huge range of activities and entertainment, however, what really makes Phuket a special holiday destination is the fact that it is the gateway to the islands in the Andaman Sea and Phang Nga Bay. Many of the idyllic picture-postcard scenes are taken on these small islands. Most of these are uninhabited and you have to take a tour or charter a boat to get there. For the best experience, take an overnight cruise which allows you to enjoy the most enchanting parts of the day; early morning and sunset. Charter boats are available with captain, crew, and meals including fresh local seafood. Jungle trekking, snorkelling or simply sightseeing, Phuket has a huge range of tours, covering every budget, interest and group size. You can join a coach tour and make some new friends or book a private excursion, get a flavour of local island life or relax with some retail and massage therapy, visit remote islands in the lap of luxury or check out the best of what is available immediately around you; there is so much choice! The First, Original, and still the Best Catamaran tours operating from Chalong, Phuket, Thailand! Daily Join On Charters beautiful Phi Phi and exotic Racha Noi. 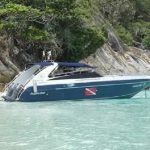 Our Racha Sun Set Charters have set the bar high in Phuket, depart from the pier, look for the family of dolphins that live at Honeymoon Island and then on to your destination island for snorkelling, kayaking, play raft and dingy rides to incredible beaches then relax with a Cocktail and watch the sun set over the horizon. What better way to bathe in the evening light than on a luxury catamaran, hearing the water play around the bow of the boat, and watching the colour pallet change before your eyes.